The Windows clipboard is one of those features of the Windows operating system that Microsoft has largely left untouched over the years. Probably the biggest restriction for most users is that the clipboard can only store one entry at a time which means that old entries are overwritten by new ones. 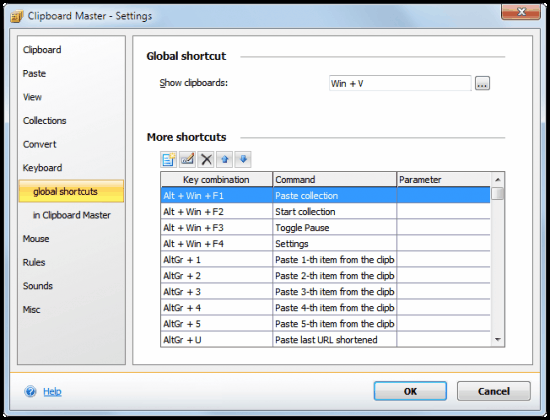 Update: Read our review of Clipboard Master 4.0, an updated version of the software program here. 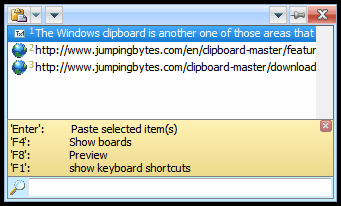 Clipboard managers like Clipboard Master extend the standard Windows clipboard. Most add more functionality than just the ability to store multiple items in the clipboard at the same time. Being able to access the Clipboard history is fine, but it is not the only thing that makes or break a clipboard software. It is for instance equally important that the program is compatible with applications on the system, or that the copying and pasting does not take longer or appears delayed. Clipboard Master comes with a lot of extra features that make the application incredibly powerful. Lets start with the basics; the clipboard manager stores all items copied to the clipboard. The default option to select them again is either the standard Ctrl-V if the last item needs to be pasted, or Windows-V if a previously copied item needs to be pasted. The program supports the selection and pasting of multiple items at once. The selection menu displays a list of stored items if you select the Windows-V option or open the menu through other means. Icons in front of every entry indicate the type, for instance text or url. The little window can be pinned to the top so that it is always visible on the screen. Items can be pasted with the enter key, or a double-click and the selection of paste. A search is provided that automatically filters the listing based on the characters entered in the search form; useful if the list grows beyond the ten or so items that are displayed at once in the window. The small clipboard history window offers two additional features that become available by pressing f4 or by right-clicking on an entry. F4 opens a side panel that displays categories. Here it is possible to filter the clipboard entries by type and to access pre-configured entries. Available by default are entries for mails and letters, HTML special characters or data and time information. Options are provided to add or delete entries from those groups. The right-click menu displays several processing options, from converting clipboard entries (e.g. lower case, decimal, binary, trimming) to different pasting options (for instance to paste with tab for form entries) and editing of entries. The program settings offer additional options. From defining program related pasting methods over automatic text conversion options to keyboard shortcut modifications and the blacklisting of items. Clipboard Master offers an impressive feature set that leaves little to be desired. The program is compatible with all 32-bit and 64-bit Windows client and server editions, from Windows 2000 to Windows 10. Downloads of the latest version, a revision history and user manual are provided at the developer website. Any thoughts on how this compares to ClipX? Clipx has not been updated since 2008. Clipboard Master offers many additional features that some users will love, while others do not care about them at all. I’m thinking specifically about the great hotkey support, ability to paste multiple entries at once, creating permanent groups for specific purposes and so on. If you are looking for a lightweight clipboard manager that can store multiple entries, then Clipx is for you, if you want additional features I suggest you take a look at Clipboard Manager instead. I use clipX too. For more functions I use another tool called click.to (http://www.clicktoapp.com/de), click.to supports social network website direct connection such as facebook and twitter, and its very useful. I downloaded the application and tried to use it. i found the behavior very inconsistent. The clipboard keeps jumping around the screenevery time i paste something, even though it is supposed to be pinned to one side. Pressing alt+ctl+ num sometimes pastes strings and sometimes doesn’t. The application looks worthwhile, maybe it’s just my system (xp sp3, office 2003). Ditto was the best clipboard manager I used but for some reason it stopped pasting text. I’ve used Clipmate ( http://www.thornsoft.com/ ) for years (not free!) but unfortunately I’ve found nothing that really comes close to it. Clipboard Master doesn’t come close. I wish there were a viable replacement for Clipmate since the author hasn’t updated the program in 2 years but keeps saying that he is “working on it” while he blames the problems on Delphi development. So I can’t recommend it at this point. But I have 40MB of clips stored in this thing (it uses a SQL dB)! It has a nice 3 panel format and allows me to create a folder structure with sub-folders. It is unobtrusive and doesn’t use a lot of resources. And very important to me is that if I copy something from a webpage, I can also return to or paste the URL of the that clip at anytime. It captures the URL via DDE (I think). There are a bunch of other features including encryption and a plethora of settings. Unfortunately none of the documentation below the top level seems to have been translated from German into English.